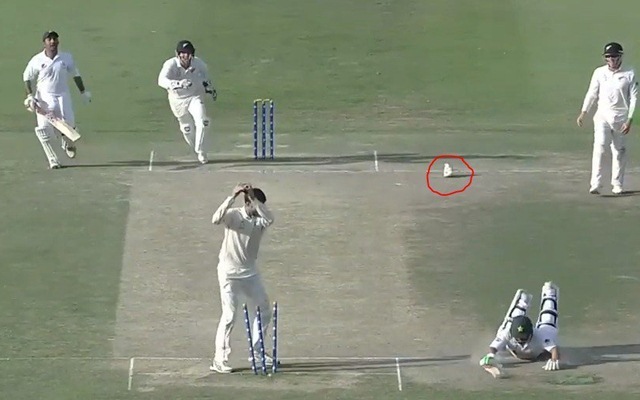 While completing the first run, Yasir had lost his shoe and he then slipped in his way while completing the second run and invited an unfortunate run-out dismissal. Pakistan and New Zealand are fighting out hard in the third and deciding match of the three-match Test series in Abu Dhabi. The match is quite evenly poised as the hosts claimed a 74 runs first innings lead before they were dismissed for 348 runs in the second innings. However, at one point in the game, Pakistan team were looking set to take a big first innings lead, but the Kiwis came back in the game amazingly well to restrict the opposition. New Zealand scored 274 runs in the first innings in which Kane Williamson and BJ Watling compiled fine half-centuries to lead their side to a challenging first innings score. The hosts lost both their openers early on in the second innings, after which Azhar Ali and Asad Shafiq stitched a staggering partnership of 201 runs and both of the batsmen scored magnificent hundreds during the stand. However, after this partnership, the lower order failed to capitalize the momentum gained by the duo. The Pakistan skipper Sarfraz Ahmed was looking to build a partnership with the lower-order batters, but leg-spinner Yasir Shah got dismissed in a terrible manner, which devastated the skipper. During the second innings in the 133rd over, Sarfraz guided a delivery bowled by New Zealand off-spinner William Somerville towards the mid-wicket region and called in the non-striker batter, Yasir for a quick double. The Kiwi fielder Collin de Grandhomme who was fielding in the deep field reached towards the ball quickly and threw it at the non-striker’s end. While completing the first run, Yasir had lost his shoe and he then slipped in his way while completing the second run and invited an unfortunate run-out dismissal. However, Sarfraz was absolutely furious witnessing the reckless dismissal as Yasir’s dismissal triggered a collapse and as a result Pakistan failed to take big first innings lead. After conceding 74 runs first innings lead, New Zealand lost both their openers in the final session on Day 3. After which Kane Williamson has played a brilliant century innings along with Henry Nicholls who is still unbeaten at the crease on 77 runs. At the end of 104 overs on Day 4, the Kiwis are currently 272-4 with Williamson and Nicholls still unbeaten at the crease and the duo has added 212 runs for fifth wicket stand and helped their side gain an important lead of 198 runs so far.